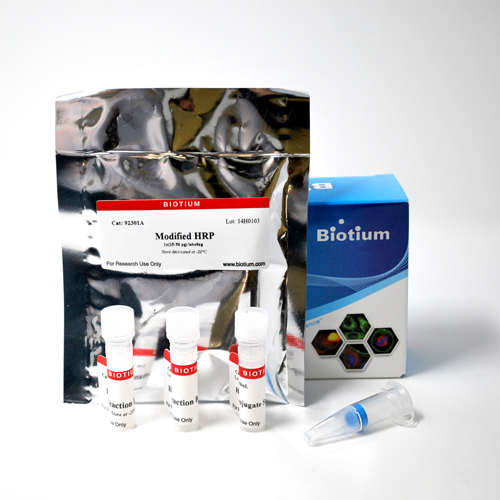 Mix-n-Stain™ Enzyme and Fluorescent Protein Antibody Labeling Kits Easy antibody labeling with HRP, AP, R-PE, APC, & more. Mix-n-Stain™ enzyme antibody labeling kits are a revolutionary antibody labeling technology that allows you to label up to 100 ug of your antibody with an enzyme with minimal hands-on time and no purification step. The labeling procedure tolerates many common buffer components and antibody stabilizers. For more information, please download the product information sheets for the kits. This kit is available with the following enzymes: HRP (horseradish peroxidase), glucose oxidase, and alkaline phosphatase. • Horseradish peroxidase conjugates can be used for Western blot, ELISA, immunohistochemistry and other standard immunoassay applications. The enzyme label can be visualized with chromogenic substrates such as DAB, ABTS, TMB and TMBUS in the presence of hydrogen peroxide. Label 10-20 ug, 25-50 ug, or 50-100 ug of antibody in about 3 hours. • Glucose oxidase is an enzyme which catalyses the oxidation of glucose with the release of hydrogen peroxide. Label 25-50 ug, or 50-100 ug of antibody in 2 hours. • Alkaline phosphatase conjugates can be used for ELISA, immunohistochemistry and other standard immunoassay applications. The enzyme label can be visualized with chromogenic substrates such as BCIP and PNPP as well as fluorogenic substrate such as MUP. Label 25-50 ug, or 50-100 ug of antibody in 2 hours.